Nothing is more frustrating than trying to order parts for your custom hydraulic presses. It could mean several phone calls to track down a vendor, and in many cases seeking a vendor overseas to find the right part. This can take a long time to ship and cost almost as much as the part itself. Instead by going through us for your custom hydraulic presses you can find all of your parts locally. Would you rather have a hydraulic press that is accurate or one that causes you to fix the part you are trying to make every few minutes? Then the obvious choice would be to pick a company that can deliver not only quality parts, but custom make your hydraulic press to fit your needs. You want your machines to be accurate and finely tuned to meet your specifications. But what is even better is that they are adjustable to your needs, so as your product changes so can the press change with it. 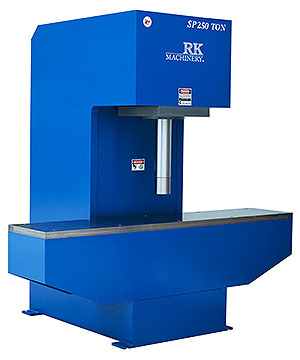 Do you really want to use shop presses that are only designed to work on certain parts? Many times these presses are heavier and take up a lot more space. Not only that but they are not adjustable, which means you would have to use a different machine for each different project. With custom hydraulic presses you can make the changes you need to for each project, saving you space and time in moving those parts around the shop. When you need the part cut in just the right way, stamped perfectly then you need the accuracy that can only come from custom hydraulic presses. Especially when it comes to a straightening press that can ensure the perfect edge every time. And that precision can only come from a press that has the exact pressure when and where you need it to be. A machine shop press can't always deliver that precision. The myth between a shop press and custom hydraulic presses is that one is more durable than the other. Many people believe that the heavier shop presses will last longer. In some cases this might be true, but only if you want a machine to do one simple task and nothing else. And if you have the extra space to store it, then it might suit your needs. However custom hydraulic presses are just as durable, and the parts are easier to locate. So if something should need to be replaced, it can be replaced quickly.